Skoda Yeti is a symbiosis of unique design, safety, functionality and comfort. The new model appears with new engines and technical solutions. Yeti - new compact SUV with small fuel consumption (8 l. on 100 km. in the mixed mode) and the minimum emissions of CO2 in the atmosphere, became the worthy answer of Skoda Auto to the environmental issues becoming more and more actual. The new model combines unique design, safety (5 stars by results of the EuroNcap tests in 2009), functionality and comfort. Thanks to a high road gleam (180 mm) Yeti shows excellent riding characteristics both on usual roads, and on off road terrain. The compact Skoda Yeti sizes guarantee easy controllability and maneuverability in the city. Appearance of the SUV which is created thanks to a silver strip of protection of the bottom and big wheel arches, promises a magnificent driving and on off road terrain. At the first view of Yeti all attention is arrested at once to the lattice of a radiator surrounded with four headlights. The door of a luggage carrier opens up that speaks about a car practicality. Black racks, outstanding design together with electrically the operated panoramic hatch, railings give to Skoda Yeti ease. 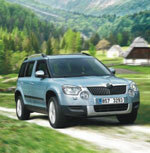 Skoda Yeti offers passengers spaciousness and comfort. Higher landing gives to passengers feeling of safety, the best review and convenience when landing. Sitting with dense stuffing, lateral support and the regulator of a lumbar bend will provide to passengers convenience and comfort on long trips. The VarioFlex system allows to transform everyone their three seats of a back row. Thanks to this system there is an opportunity to change internal space of the car practically without restrictions. The new specially developed dashboard emphasizes new and reserved interior design. In the car there is enough a place for storage of things. Protection of passengers and the attitude towards other participants of traffic - one of the key moments at creation of the new car. Skoda Yeti received the appreciation "five stars" by results of the krash-tests which are carried out by Euro NCAP. Total of the points gained during tests reflect a high rate of safety of Yeti in the categories "Protection of Adult Passengers", "Protection of children" and "Protection of Pedestrians". The most important elements of active safety of Yeti include biksenonovy headlights with rotary modules (for Experience) which light turn better and thus indicate any danger. Forward fog lights have unusual and bright design. Electronic systems of stabilization of ESP, EDS, AFM, HBA DSR, ABS, MSR, EBV, ESBS and ASR will help to prevent unexpected collision. The risk of back collision in a stopper on the highway is reduced thanks to automatic function of fire of brake signals during sharp braking, and lamps of the alarm system light up independently after a car stop. Very important role is played by passive safety. The strong design of a body, reliable door thresholds and racks, special fastenings for the engine and pedals, nine safety cushions, including a safety cushion of knees of the driver and lateral safety cushions for back passengers, will reliably protect the driver and passengers. The option of shutdown of fuel and certain electric chains at accident that helps to prevent ignition is included in the basic package. Also at accident the central lock opens, internal lighting lights up, the alarm system which will pay attention of other participants of traffic to danger turns on. Skoda Yeti Skoda Yeti is a symbiosis of unique design, safety, functionality and comfort. The new model appears with new engines and technical solutions. Skoda Fabia Combi New Skoda Fabia Combi will draw your attention at the first view of its harmonious design.